Broadway professionals are incredibly good, better than they’ve ever been before. We’ve grown to expect this absolute best and the wonderful people who create the performances delighting, astounding, moving us dig deeper every time to please, not just us, but themselves, every bit as important. 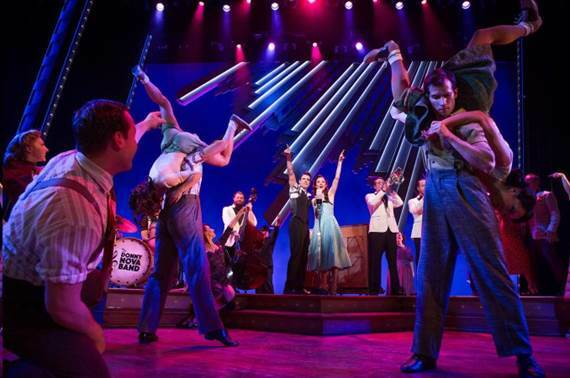 Bandstand, the whole of Bandstand is such a striver, every craftsman-artist, every performer artist at peak, especially choreographer-director Andy Blankenbuehler, who already has a modest little success called Hamilton flirting on the boards. Blankenbuehler has embraced the show with all his heart and given it back to us in a swirl of emotion and entertainment that never falters, spinning his wonderful dancers throughout the show, from light hearted scenes to darkly driven strokes of color and power. Wonderful dancers who sing. Wonderful singers who dance. Wonderful actors who sing and dance, are funny, and heartbreaking. And play instruments. Head shakingly amazing. Creators Richard Oberacker – he wrote the music – and Rob Taylor – he wrote the book and lyrics with Oberacker long time show business musicians, – start ominously, segueing the deep beat of the music into the blast of battle and death. 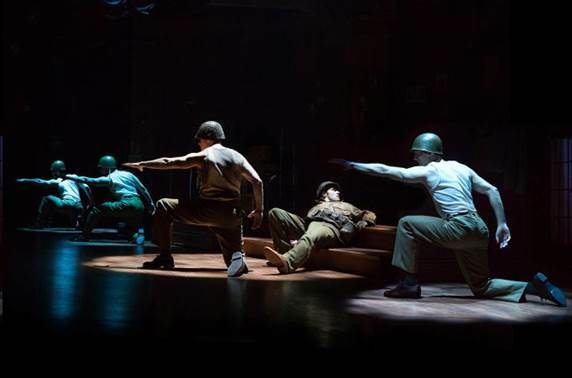 We’re in a World War II flashback and Donny Levitzki (Corey Cott giving his exceptional all) sees his best buddy killed before his eyes. Simultaneous, swift, muscular dance moves and Julia (lovely Laura Osnes) receives the terrible news: she’s a widow. War over, hard, insightful dance as returning men fight their demons and want things to be “Just Like It Was Before”, the first big song, everybody striving, everybody carrying inner burdens told in dance – what dancing! – and Donny determined to get back to his piano, his life in music. He’s going to start a band, a swing band. There’s a contest. The winners get to play in New York, get to be in the movies in Hollywood. Donny’s going to do it. Gotta be all vets. No longer kids. All top flight musicians. All trying to get back their lives. Yes, we’ve heard this story before but not with this ferocity of purpose, not with these men, and the song, “I Know A Guy” leads Donny to musician, to musician, to musician, Jimmy, the sane one, sax and clarinet(wonderful James Nathan Hopkins), Dave, bass and bawdy (splendid Brandon J. Ellis), Nick, hot temper, hot trumpet (endearing Alex Bender), Wayne, obsessive, compulsive, trombone (frightening, touching Geoff Packard), Johnny, the drummer, war still in his head (so good Joe Carroll). They work out, getting it together, they get a job, it’s a club, the people are friendly and frenzied, the dancing is spectacularly good. 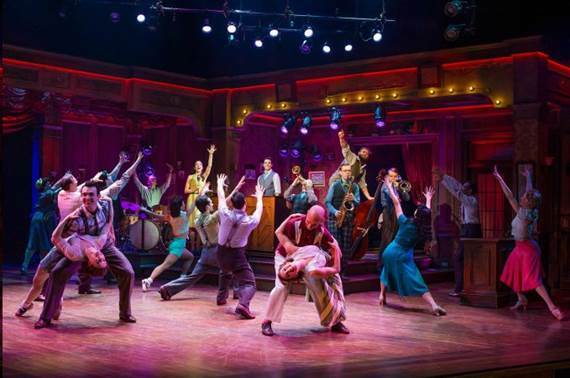 It’s the essence of forties, fifties jitterbug, jive, swing but with today’s superb talents it’s raised to poetic levels, worked into all phases of his story telling by wizard director-choreographer Blankenbuehler. Donny feels secure enough to try to contact Julia, his dead buddy’s widow and she’s beautiful and everything you’d want and all he can think of is his dead friend and how he died and how he cannot tell Julia any of this. But Julia’s got a mom (delicious Beth Leavel) who is warm and funny and understanding and just the right amount of pushy. And Julia can sing. (As if you were surprised. It’s phenomenal Laura Osnes, that’s what she does above all) and “Love Will Come and Find Me Again” telegraphs it all and why not. Julia and Donny are spilling pheromones, they are wonderful together in the electric personages of Corey Cott and Laura Osnes. (In addition to all else, we’ve got chemistry!) 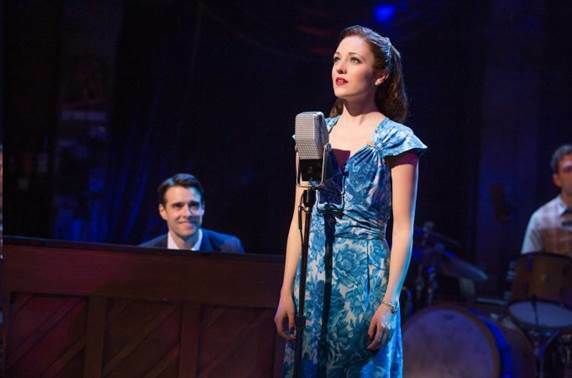 Yes, indeed, she becomes the girl band singer, but who knew Osnes could belt like that? And her bluesy, sardonic, tear-it-up “Welcome Home”, crying for all the guys who came home and didn’t find it home, a whole, new dimension in Laura Osnes? It’s a make or break song and she makes it and better yet breaks it. Oh, happy composers Oberacker and Taylor. The astonishing director Blankenbuehler never falters and neither does his crew. David Korins delivers a super solid back home Ohio drabby bar setting in the first act, warm as his superb dancing company, and when, despite sleazy sharp practice by the contest runners, winners Donny and the band find they’ve won empty promises, they finally do get to the Big Apple, this time with designer Korins outdoing himself. Eye popping essence. Lighting designer Jeff Croiter continuing top form. Sound designer Nevin Steinberg building the crescendos, costume designer Paloma Young, her palette faultless, the flirty swirl of the clothes dance sensitive. And everybody caring. In a season of many gifts Bandstand stands very high. Bandstand. At the Bernard B. Jacobs, Theatre, 242 West 45th Street. Tickets:$59-$229. 212-239-6200. 2hrs, 30 min. Open run.